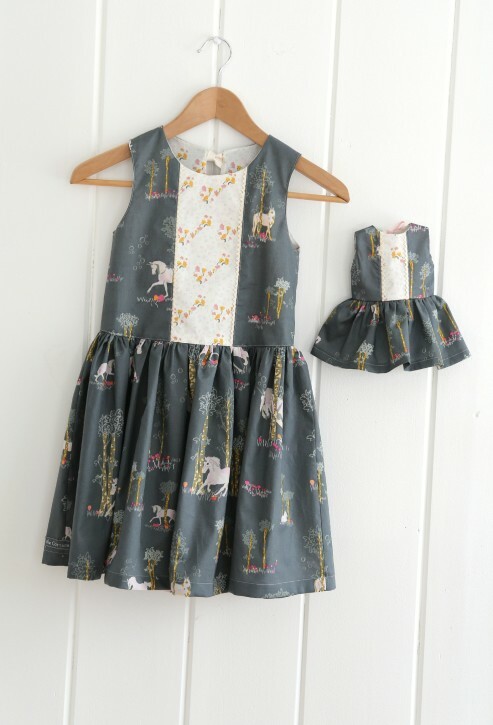 Today I wanted to share the Unicorn Birthday Dress and Matching Doll Dress that I made for Savannah’s 7th birthday. We had agreed that we wouldn’t do many presents on her actual birthday since we were going to have tea at the American Girl Store (in lieu of a party with friends) and she was going to get to pick out some presents at the store. However, I wanted to surprise my little birthday girl with something for her to wear on her trip to downtown Chicago. I wanted to make a dress that I knew Savannah would actually want to wear. She doesn’t like anything too fussy or embellished these days. I drafted this pattern pretty quickly, so I really hoped it fit her properly (and it did!). This is just a slightly dropped waist, easy to wear dress. I REALLY wanted to add some buttons to the top of the dress and more trim at the hem, but I held back since I knew it wasn’t what she would want. The only trim I added was to the inset on the top of the dress. It adds a nice subtle detail. I also added some single-sided fusible interfacing to the back of the ivory floral print so that the lining of the dress wouldn’t show through. The back of the dress closes with a simple bow made from double fold bias binding. 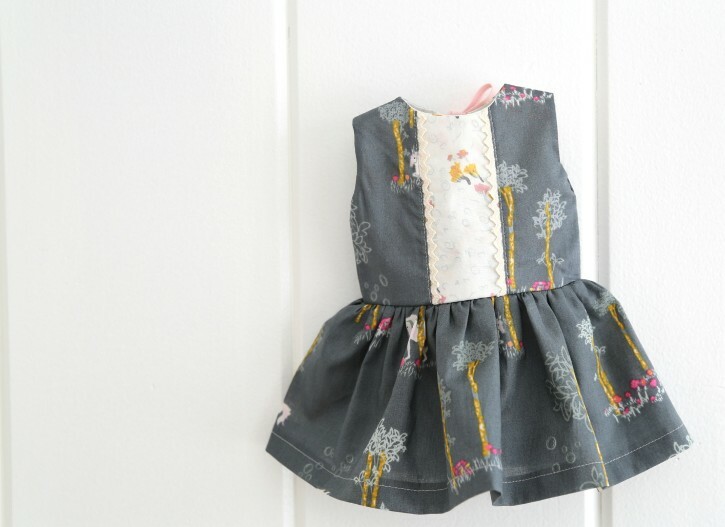 Again, simple and sweet…….just what my Savannah Rose likes her clothes to be. I might consider having this be one of my upcoming patterns. 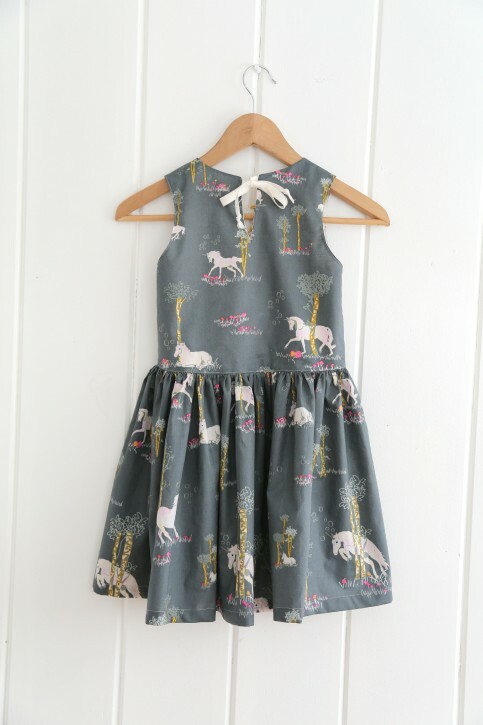 It’s really a very versatile dress and is perfect for little girls and big girls, alike. 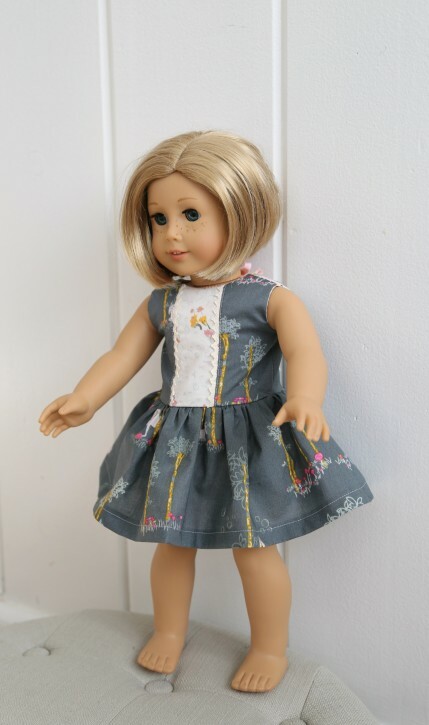 I used a dress that fit Savannah’s American Girl Doll (Kit) to draft a matching dress for her to wear as well. I thought about making something that just coordinated, but I’m glad I didn’t. Savannah wanted to match her doll exactly. They even wore matching pale pink tights, ivory cardigans and boots. After I took these pictures (before I gave these to Savannah), I realized that Kit needed a hair accessory as well. I made a sweet rolled rosette out of the unicorn fabric and sewed a pink flower button on it. I sewed it to a hair elastic and Kit wore it as a headband. Savannah wore a headband covered in pink grosgrain ribbon with a little pink bow on it. We had the absolute BEST time at Savannah’s tea at the American Girl Store. We had a group of six……Savannah, her sister, Matilda, Savannah’s Gigi (my mother-in-law), Aunt Abby, Aunt Katie and myself. It was such a fun day taking the train into the city, shopping and eating…….definitely a day to remember! I wish I had some pictures to share with you of Savannah in her dress. She looked so precious. I chose not to bring my big camera with me to the city. Sometimes I feel like I end up taking too many pictures and I’m not fully present in the moment when I have the camera with me. I wanted to make sure that I had the full experience with my girls and we will save all of the wonderful images in our memories forever! Happy 7th Birthday, Savannah Rose! 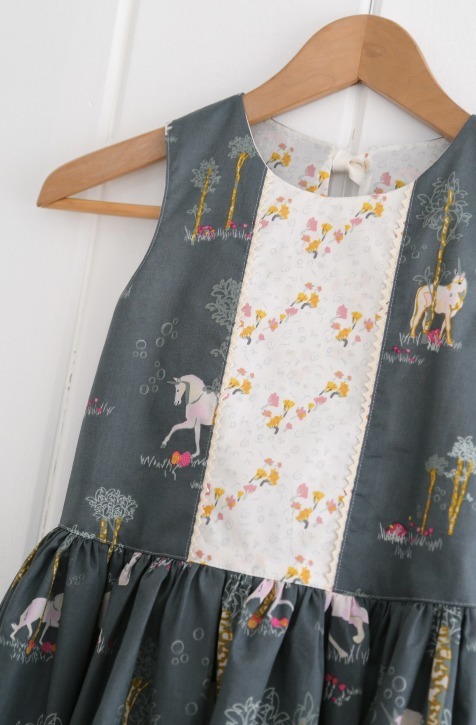 Do add this to your patterns – it would be perfect for my older GDs! Lindsay, I would love this pattern. I like the fact that it’s not as fussy. It also looks easier to sew which for me is important. :). I would love this as a pattern – but must have the doll pattern too! My daughter was peaking over my shoulder and said mommy I want that dress for me and my dolly! Beautiful dress, and I love that it has the matching doll dress, too. 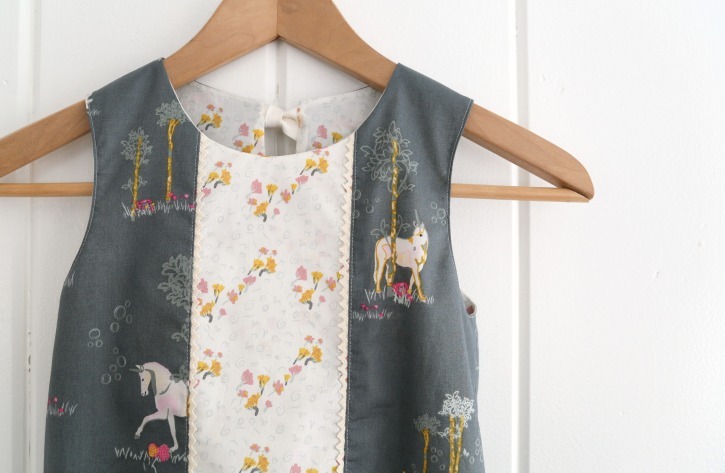 This is such a fun and adorable pattern that my two little girls would absolutely love! Especially to have a matching dress for their dolls… that’s always a HUGE deal for them!!! I would love to have this pattern for my grand daughters too! This is a perfect, simple and they would love it. Please make this pattern soon. Love it. Such a cute dress! I loved. Thank you so much Lindsay, this is adorable! And the birthday events sound like so much fun! beautiful dresses! Please share the patterns soon! Gorgeous fabric as well. Where could I find the fabric you used for the middle part of the dress? Thanks so much!!! Is this pattern available to buy, love it? Wondering if this pattern is available? It’s so beautiful. My niece would love the dress for her and her doll. Yes, this is my Savannah pattern that you can find over in the shop! Did you post the doll pattern in the shop too? No, I didn’t! Sorry about that….